BURNOUT appears to be a particular risk for high achievers who are passionate about what they do and deal with problems and challenges with a “can do everything” approach. The medical profession actively selects and encourages these attributes, so it should come as no surprise that doctors turn out to be at high risk for burnout. Risk factors for burnout are well described and include: working exceptionally long hours, taking on exceedingly heavy workloads, putting enormous pressure on oneself to excel, constantly performing at exceptional levels (while being very upset by failure), and constantly “stepping up” – all of which are pretty much how we expect a “good” doctor to behave. The culture of excellence that pervades medical practice makes it difficult for young doctors even to anticipate ever failing to perform, so those who do burn out rarely see it coming, and it comes as a devastating shock. Like many, I have misunderstood burnout. I thought it was something that explained older male doctors (like me) becoming grumpy and disengaged. The facts tell a different story. Stereotyping can be unhelpful, causing us to miss those who don’t fit the picture. Many younger male doctors suffer burnout, and older male doctors are certainly not immune; however, surveys suggest that the most “at risk” group of doctors seem to be younger, single women who are profoundly bright and committed, and next it’s younger women in general. They take on everything asked of them without hesitation and are fabulous, empathetic clinicians. They are highly self-critical and drive themselves hard. They provide willing cover for roster gaps – and every other crisis. Their empathy easily gets them involved with distressed families and with every other problem. They are utterly invaluable and invincible … until they hit the wall with spectacular burnout. Burnout can have serious negative outcomes for great individuals; therefore, it is vital to be able to recognise and minimise the things that we know contribute to it. Burnout is more likely to occur where there is a poor working environment. These places have poor communication – nobody knows what others are doing and messaging is often uncivil and unprofessional. It’s where staff don’t have “agency” – where they can’t control things, don’t get listened to and get “dumped on”). In such workplaces, stressful experiences are frequent and unresolved. Workloads are unrealistic and there are impossible expectations. Personal problems that make people vulnerable to burnout generally involve a life outside medicine that does not provide adequate opportunity to recover from the stress of the work environment. These things can be temporary (such as marriage breakup or parenting difficulties), or can be longstanding (such as chronic alcohol dependency, isolation or an obsessive, self-critical personality or an ego that heavily relies on performance). Rumination – that is, repetitively focusing on one’s symptoms of distress and the circumstances surrounding these symptoms without resolution – has also been suggested as a maladaptive strategy that predisposes to burnout. Burnout has some clear and characteristic features. Typically, someone who has been energetic, enthusiastic and effective in the workplace morphs into someone who lacks energy (suffering insomnia and regularly complaining of being exhausted), becomes cynical and emotionally detached (becoming pessimistic, uninterested and unsympathetic – even cruel), and who becomes increasingly ineffective (making errors, not completing tasks and not engaging effectively with others including colleagues, patients and staff). It can be awful for the individual doctor and the implications may be catastrophic. Jobs may be lost, promotion becomes out of the question, and there may be mounting workplace complaints. At the same time, vital personal relationships outside work break down, resulting in a spiraling of stress levels. In severe cases, suicide is a very real risk. It is clear that an irritable, pessimistic, unengaged practitioner also creates a stressful environment for colleagues, who may then become more likely to burn out themselves – making the problem much worse, as a whole group or department becomes dysfunctional. There are also profound implications for patients, as burnout may create a dangerously ineffective doctor who provides an unsafe clinical situation. When burnout is recognised, it is imperative to act. Burnout doesn’t seem to get better on its own, when nothing changes it just gets worse. There are two main ways to change things, to change the person and to change their work environment. Most of the things that are advocated are designed to reduce the stress levels at work and to ensure that there is opportunity to recover from stress. Much recommendation is based on common sense and experience. There isn’t much firm evidence because there are almost no good studies of interventions. Suggested interventions for burnout can include a variety of things. As in many conditions, simply naming the problem can be a huge relief; it provides reassurance that there is a defined condition that has a solution. This can greatly reassure a doctor who may be confused, distressed and frightened about what has been happening to them. A holiday may be a good way to get the doctor away from an environment that is having an adverse effect and is a good way to break the cycle – but it is important that they are able to return to an improved workplace environment. Encouraging the affected doctor to review their workload may be a useful strategy. We all have things at work that we enjoy most, those things that give us most satisfaction, and things we struggle with and really don’t enjoy. Sometimes we have no choice but to do the things we dislike because they are an integral part of the job; however, it is surprising how often there is a choice. Even small reductions in “bad things” may bring relief. Where the job predominantly involves “bad things” that can’t be changed, then it’s probably the wrong job. Maybe it’s time to change. Many doctors work exceedingly long hours, often working in several roles in different locations. Shedding the most stressful and least satisfying of these may be profoundly liberating (thinking about how much income is absolutely necessary may be useful here). Taking time out (from a stressful work environment) to repair personal relationships that are on the brink of collapse may be a fantastic investment. A settled, supportive, loving relationship (of all sorts) provides an ideal environment to reduce and recover from work-related stress. Changing the workplace culture may be more difficult, but may be highly appropriate. Interpersonal conflict in the workplace is a potent cause of stress. Recent reports suggest that about 30% of doctors experience bullying or harassment in their workplace. There are many reasons to deal with this, but evidence that staff exposed to such behaviour are suffering from burnout should be a potent call to action. It is inevitable that in medical practice stress will repeatedly occur – things like death and intense suffering can’t be regularly observed without having an impact. It is essential that there is access to debriefing, mentoring and counselling to help practitioners resolve or reduce the impact of repeated stress. Employing organisations and professional bodies have a responsibility in this regard. Rates of burnout decrease with the age of the doctor and it seems that clinicians develop coping strategies. Experienced doctors who have worked out how to cope have a responsibility to share solutions with colleagues who are struggling. I have certainly shared my strategies with colleagues over many years. For me, the most effective thing is long solitary walks with the dog. This keeps me out of the way of everyone, so I don’t upset them. Moreover, my dog is a perfect listener. He never expresses any opinion, but he’s totally supportive. I also have great mentors (medical and non-medical) who understand the need to give support and to provide a safe space to let me “vent”, reliably keeping the content confidential. Finally, alcohol seems a perfect remedy for stress. Collapsing at home with a drink after a terrible day may seem earned, but it may easily become so regular and excessive, when stress continues, that it may greatly exacerbate the problems of burnout. Then, it’s easy to blame the drink rather than identifying the serious burnout that underlies it. If you recognise any of the above in yourself, or in a colleague, then I urge you to be courageous and act. Share your concerns with a trusted colleague and let the healing begin. 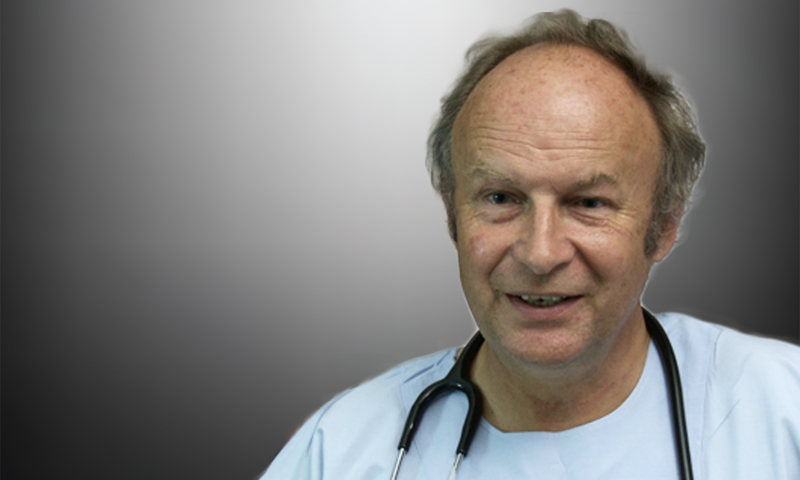 Associate Professor Charlie Corke is a senior intensive care specialist at University Hospital Geelong, and is President of the College of Intensive Care Medicine of Australia and New Zealand. Thankyou, Professor Corke for this very well expressed summary of a major problem in our profession. After 30 years as an Obstetrician in private practice with its 24/7 call, sleep disturbance, intense patient interaction and high litigation potential I am very familiar with the burnout scenario. Colleague support and improvement in workplace practices will be critical in this field. Excellent and very well expressed. Should be emailed to all doctors. We need to make sure we don’t link doctor suicide with underperformance. The culture of assuming a mentally ill doctor is always struggling is widespread and a dangerous deterrent to asking for help. Instead, we need to be kinder to each other in hospitals – bullying of doctors at all levels needs to be addressed (including from medical, nursing and administrative). Excellent article about a very serious problem. A problem that causes a higher rate of suicide in young female medical practioner wrt general population. The answers are complex. But there are a few simple things that may help. A well organised mentoring programme can be useful during the training years. JMO common rooms that are cleaned and maintained by the organisation – rather than becoming filthy cesspits that no one visits. Gives some reflection that young doctors are valued by the organisation. After twenty five years in the profession I was suddenly labelled a potential risk to the public after I suffered a severe flare up of the chronic depression the I have dealt with since I was in my early twenties. The exacerbation was caused by significant workplace bullying and abrogation of duty of care by the executive at my hospital. The CE then reported me to the State Medical Council. And I am not the only practitioner to experience this. So how are doctors meant to be open and honest about issues of mental health when this is the response of the leadership at there institution? I could not in good conscience encourage individuals to be open with the senior administration who are more likely to act in a punitive rather than a supportive way. Yes. The higher powers whom we are told to seek support from, instead of helping me they punished me for trying to speak up. The ordeal has been detrimental to my mental health and the thought of it continues to be distressing. Perhaps this is not so much about medicine but the world in general, that is, only the strong survive. Burnout and other serious psychopathology has been identified over the past 30 years in medical students, young doctors, older doctors, in most specialties and in many cultures. The rate is not diminishing and essentially all health administrations turn a blind eye. The sending of ill-prepared, young doctors into harms way, where many will suffer dreadfully and some may suicide, has been called “institutional violence” by one sociologist. Most experts in this area recommend open and honest discussions with medical students early in the course together with a programme to teach mindfulness, emotional self-awareness and resilience. The evidence is strong. Medical students and young doctors should demand this. Also it would be ideal if medicine could be conducted in an atmosphere of greater support and compassion for everyone. Wishful thinking perhaps! What an important article. I think it’s important to be honest. I was diagnosed with a mental health problem, and the Medical Council of NSW have actually been very supportive. Although I have to attend meetings with them and a council appointed psychiatrist every six months, along with my own psychiatrist at intervals to be dictated by him, they’ve really helped me at every step in my own recovery. In addition, they initially put some restrictions on my practice that helped me to recover, which I didn’t really understand at the time, but for which I am now grateful, such as requiring their approval to work overtime/weekends, and monthly supervision meetings with a pro forma to be filled out, which were actually more about providing support! I’m now in a position where my restrictions are being lifted gradually, and I know I couldn’t have gotten to this point of recovery without the help provided by my specialist, the council appointed psychiatrist, and the MCNSW; also my family and friends, who have supported me at every step of the way. I would urge everybody who has a mental health illness to open up and seek the advice of a professional, even anonymously; the stigma of mental illness is what exacerbates the problem. People with a serious mental illness have worse life expectancy than indigenous people, and this is a result of our unwillingness to acknowledge mental health issues. If we as a profession don’t acknowledge the importance of mental health, how do we expect policy makers and the general public to understand its importance? Even in most of our hospitals, the mental health ward is outside the main building, away from everyone else, and nobody covering the after hours shift can even find it. Why the heck? Last year, in NSW, I heard of four doctors that committed suicide, three of them in the BPT program. It’s time to lead by example, and declare the importance of mental health issues, and lift the stigma surrounding mental illness. Thank you for your well written article in regard to this important problem. I most definitely developed burn-out. After 50 years as a General Practitioner I voluntarily retired just before my 78 birthday. Treating my patients remained enjoyable but tedious. What my problem was I developed difficulty learning. I became concerned about treating a patient and forgetting some important decision as simple as forgetting the name of the drug I wanted to reply. I do not have any psychiatric disability. The freeze not enter into my decision. But the computer changes made to General Practitioner by the Governments and my employer were very difficult for me to memorise. I was much slower in treating my patients. The decision to retire was difficult. Retirement itself is most difficult. I miss my patients greatly. But the decision was correct. My ‘burn-out’ was real. My retirement is difficult until I decided to enrol in several courses on Open University. The pressure I was under while treating my patients has gone. I truly believe I am more content in myself. My wife may offer a different decision. Medicine is a profession by its very nature based upon altruism and self sacrifice. (1) One’s urge to self sacrifice changes over time. The 20 year old single uni student who just got into medicine is full of passion and altruism. The same person at age 31 with 2 kids and still struggling to get onto the training program of her dream – reality hits and the altruism and passion are gone. She might be labelled as a “bad doctor”, she might be labelled as “burnt out”. But truth is, her priorities have changed … She realises – patients are not worth it, the medical profession is not worth it. At the end of the day, it is JUST a job. Just like plumbing or investment banking or software engineering or quantum physicist. It’s just a job. This epiphany re: work-life balance should not be stigmatised as “burn out”. (2) The degree of altruism required in medicine is NOT conveyed early enough. Young 18 year olds with underdeveloped frontal lobes are deluded into delivering non-sustainable soliloquays during their med school interviews – “I want to do medicine because I want to make humanity better”. But wait a minute … at what cost to yourself? If anyone were to say “i want work life balance” in a med interview – they will be insta-culled. Yet, this is actually the most “sustainable” answer! The deluded altruistic souls will later realise the degree of altruism required is not sustainable, this is actually not the life I want, wait a minute, I actually do not know how to do anything else outside medicine, I’m so trapped, my life is over, it’s better dead than alive, i’ll kill myself. Some of our brightest young minds should be made to understand at a young age (a) how much self sacrifice is required in medicine (b) how much sucking up required to get on training jobs (c) their beautiful minds may better serve humanity in many other ways, which provide much better work-life balance. tl;dr? if you are thinking about getting into medicine – it’s like marriage! divorces are always messy – have a long hard think before you commit!